NCC: What is a polynya? A polynya, pronounced “pol-en-ya,” is a large area of open water surrounded on all sides by sea ice. Simply put, it’s a big hole in sea ice. But its purpose and how it comes to be is much more complex than its appearance suggests. In total, Canada’s Arctic contains 23 polynyas. Polynyas are formed two ways, both of which involve heat. A sensible heat polynya is created when warm warmer sits on the surface of the sea ice. This keeps the temperature of the surface water at or above zero degrees. The other way a polynya is formed is when wind or ocean currents move a portion of sea ice away from a fixed point, such as a coastline. This polynya, called a latent heat polynya, is considered the area between the broken off portion and the fixed point. How does a hole in a chunk of ice help marine life? Marine mammals, such as narwhal and walrus, are dependent on polynyas, and will build their life around it. 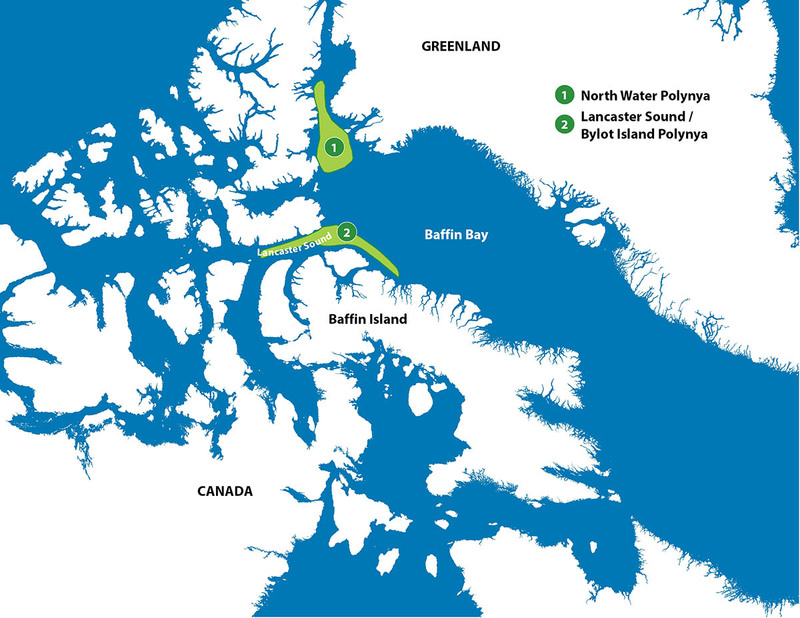 The North Water Polynya, located between Canada and Greenland, is the largest Arctic polynya and provides refuge to marine mammals to feed and rest in. The open water within the polynyas is one of the most productive ecosystems in the Arctic, as their warmer water temperatures house plankton for Arctic cod to consume. With a bounty of fresh cod within a flipper’s reach, narwhal, whales and walruses are able to feed on the fish. Polar bears often hunt for seals along the ice edge of polynyas. Marine mammals aren’t the only species getting their fill. The North Water Polynya is a haven for millions of seabirds; approximately two-thirds of the global population of thick-billed murres visit this polynya for a snack. How is NCC protecting this habitat? The Lancaster Sound polynya is a latent heat polynya that supports an incredibly biodiverse region. 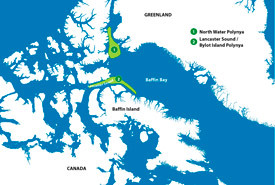 On June 8, 2016, Shell Canada contributed more than 860,000 hectares (8,625 square kilometres) of offshore rights in the waters of Baffin Bay, near Lancaster Sound to the Nature of Conservancy of Canada (NCC). Inuit communities, along with other conservation organizations, have been working for decades to advance this Marine Protected Area. NCC was pleased to help accelerate a marine conservation initiative of global significance by subsequently releasing the rights to the Government of Canada, to further Canada’s commitment to protecting oceans and coasts. These waters will be added to the Tallurutiup Imanga – Lancaster Sound National Marine Conservation Area. This region includes the Lancaster Sound polynya, a latent heat polynya that supports an incredible biodiversity region. 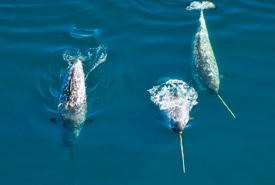 It is home to species such as polar bears, seals, narwhals, belugas and bowhead whales. It also serves as a migratory route for marine mammal species, such as bowhead whales, narwhal and killer whales and sea birds species, such as black-legged kittiwake.